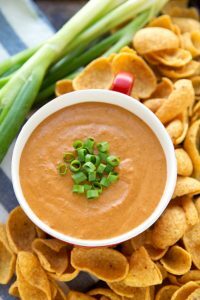 A simple blender chipotle ranch dip with plenty of flavor and a delicious spicy kick. 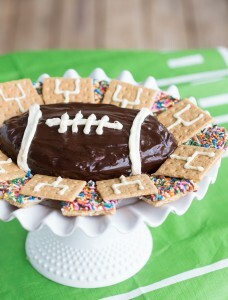 I know I’ve said it before, but football season and football games are ALL about the food for me. 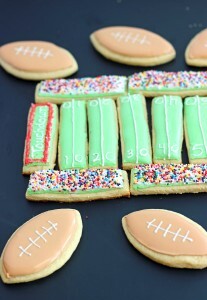 I mean, I do enjoy a good football play, but for the most part it’s the game food I get excited about. Cheese, chicken wings, and all the dips. Since I don’t eat this kind of food too often (more of a soups and salads kind of gal), I seriously enjoy it the few times of the year during football games. I’m allll about the delicious dips and yummy boneless chicken wings. Honey BBQ chicken wings are hands down my favorite! Usually we opt for some sort of bleu cheese or honey mustard dip, so I thought I’d change things up a bit and do a simple chipotle ranch dip. Chipotle and ranch is honestly a perfect complement for honey BBQ wings. The smokey hot flavor of chipotle with the sweet tangy BBQ chicken is delicious. Also, celery in this dip. JUST DO IT! Speaking of celery. My little toddler claims he loves it and he wants it all the time. Seriously. He’ll open the fridge and point to the bag of celery. (That or milk…or yogurt.) By the way, it’s pretty much the cutest thing ever to see a 2-year old open the fridge and just stare at the food like a little adult. Or what I do like every single day. ? Anyways, after I wash a stalk and cut it into pieces he will subsequently chew on it for about half and hour and then spit it out. Every.single.time. How do I get him to swallow the celery?! I guess I shouldn’t complain about his weird celery habits, he is the best salad eater ever. And he loves broccoli. That’s not normal right? I hated broccoli as a kid. Unless it was coated in some kind of cheese sauce or expertly hidden in a cheesy casserole. Another delicious way to use this dip is as a sandwich spread. After using it for our wings, we had quite a bit left-over (you can always halve this recipe) and so I started putting it on sandwiches. It’s seriously amazing. Like a delicious mayo spread that is ten million times better than plain mayo on a sandwich. The husband also thought it would be delicious on burgers. Which it is. ? Combine all of the ingredients in a blender or food processor. Taste and adjust -- adding more seasonings to taste preference or increasing the chipotle peppers to heat preference. Enjoy garnished with green onions. *I buy a 7.5 ounce can and start with 1/2 of 1 single chipotle pepper (remove seeds if super sensitive to heat). Do not add the entire can, start slow and then add more until this dip is to your heat preference. Note that this dip does get hotter after sitting in the fridge overnight or for a few hours. This dip looks fantastic, Chelsea! I’m all about the food during football season too. I could totally imagine myself devouring this dip. Love that it’s made in a blender, too! I pretty much hate all sport. But if the people in my life who are devoted to such weird activities (ahem, husband beast) would make it more about the food I feel I could get on board. I’ll tell him to get right on that. I made this to smother Chicken Avocado Burritos and it was to die for! Even my mayo-hating husband loved it. Score! This looks delicious! Could you use ranch dressing or does it have to be the dry mix? Unfortunately no. The mix will already be “diluted” (the mix is basically before adding buttermilk/mayo) so the dressing won’t be strong enough for the dip.